But how different his situation was two years ago. Shankar used to spend the entire day herding his family’s goats and going to school was not even an option. That was until his mother was approached by the Manjari team, after which she made a life changing decision: Her boy should be in school. It was a decision that was to have far reaching impacts for the whole of the Budhpura community. Shankar’s parents had both been working in the cobble stone industry for many years until his father started to suffer from bad health. Shankar’s father’s poor health meant he has not been able to work for the last few years and because of this the family were already struggling to make ends meet. Nonetheless, Shankar’s mother was convinced that education could give her son a better life. Although it was not an easy decision, Shankar’s mother decided to sell the families herd of goats and to use the money to pay for her son’s education. Shankar had never attended school before, so he was placed in one of Manjari’s bridge-schools to prepare him for formal education. Bridge schools, or bridge courses, are meant to make the transition from work to school easier for children. The smaller the gap from labour to school, the more children will succesfully make the transition, and the less likely they are to drop out of school in the future. 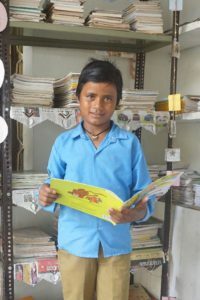 After 6 months with the Manjari Bridge school, Shankar was finally able to enrol in formal education. When asked what he likes most about his education, Shankar has a clear answer: “reading”, he says resolutely.“Reading books and short stories.” Outside school hours you will often find Shankar in the library at the Manjari community centre brushing up on his reading skills. Only after he has finished his extra school grammar classes though. As mentioned before, when he finishes school he wants to become a teacher; to pass along his knowledge to a new generation. Its great to see him working hard to achieve his goals and with such a strong work ethic its no wonder he has become an ambassador for the CLFZ project.